The history of hamlet Aschbach on Frankenberg above Rennweg begins in the Middle Ages. A mighty castle stood at this place in the 12th Century. The farmhouses were inhabited since the 15th century. 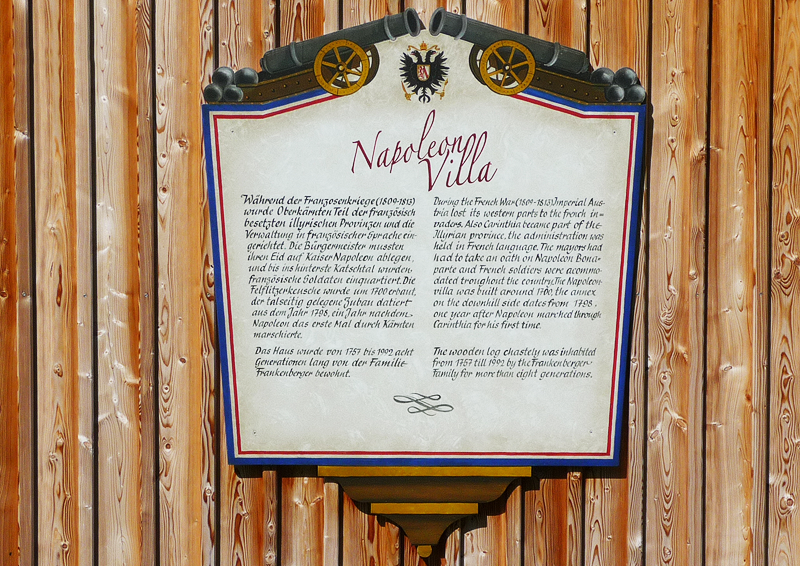 Since early 1700, the Napoleonvilla is documented in some sources called “Felflitzerkeusche”. The house was built in the typical Einhof-style (House and barn under one roof), probably first in the 13th or 14th Century on the strategic heights of Aspach (today Aschbach). At this location on the western slope of the Frankenberg already in ancient and medieval times, a fortified fort had been built to secure the pass traversal. The house is on the preserved Roman road that crosses the Frankenberg and Lausnitzsattel to Salzburg, and was probably originally erected by OTTO CHAETZ (pronounced Kaetsch), the patron of the Katschtal. The CHAETZERs (Katscher) were first mentioned in the year of 1123, they were the owners of a number of courtyards in Katschtal, including Castle Rauchenkatsch. Their second fortress Castrum Chaetze superior (Castle Oberkatsch) has been lost, it was probably located in St. Peter nearby or even on the western slope of the Frankenberg, the former Roman fort. The castle has been eventually destroyed or burned down, and the stones were anyway used in the brick surrounding farms. On 3 October 1351 Otto CHAETZER, a powerful feudal lord and vassal of the archbishop, wrote with the consent of his son Wilhelm, his (still preserved) last will, in which he donates five acres at Aspach, a small courtyard in the Chrembs (Krems Bach) and annual kind to the church in Chaetz (Katsch) and the Church of St. Georgen. His son WILHELM got the Hube Aspach including tithes, his cousin LIEBHARD got his house at St. Peter, his cousin Wilhelm a house in Sumereck. Since then the owners of the Aschbacher-estate annually had to pay the church rates. According to the oldest church Urbar of Katschtal there were already in 1502 at least two dwellings at Aschbach whose owners (GENSER and Aspacher called) had to pay interest every year to the church in form of natural products (wheat, rye, oats, lambs, chickens) and probably had to work for it. Around 1595, the house No. 1 and No. 2 were in possession of two lines of the Aschbacher family. Presumably, but not documented detectable, both lines had a common ancestor, after it apparently came to an inheritance among the two oldest sons Christoff (STOFFBAUER) and Martin (MÖRTENBAUER). While the name Aspacher and Aschbacher (name Sebastian, Adam, Christopher, John, Joseph, George, Peter, etc.) on the house No. 1 is consistently detectable since early 1500, the house No. 2 Mörtenbauer (1598 George Aspacher) after the marriage of Mary Aspacher with CHRISTIAN RAUTER went for more than two hundred and fifty years or eight generations to the family of RAUTER (Rauter-Names 1641: Martin, Andrew, Joseph, John, etc), and later to the Ramsbachers, another widespread clan. The FELFLITZERKEUSCHE someday emerged from such division of farmyards. The first detectable owner was Georgius Planckh. He may have built the Einhof in its present form – a block house in 1700. His daughter Elizabeth (born 1732) took over the property after her marriage to MELCHIOR FRANKENBERGER in 1757. Melchior came from the Wastlbauer on Frankenberg to the hamlet Aschbach and was owned successor of his father in law at the house, which at that time belonged to the Count of Lodron’s Marianum Collegium in Salzburg. The Frankenbergers lived in the house more than two centuries until 1992 as farmers, blacksmiths and merchants. 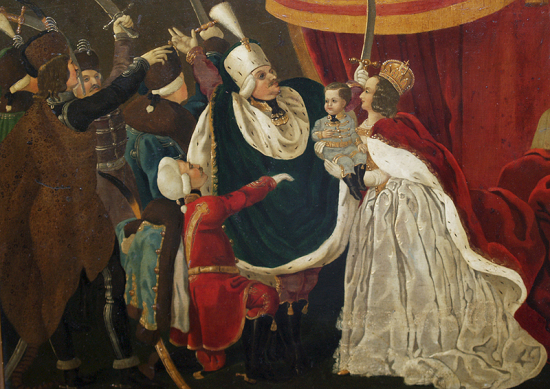 The last of them - GEORG FRANKENBERGER - remained childless in the eighth generation. According to the decision of the Heritage Institute the Felflitzerkeusche is a cross-piece of Einhof of the 18th Century. The lower part annex dates from 1798. As part of a survey of rural architecture of Carinthia, the house was declared a National Monument in 1992 - especially because of its preserved original cereal box on the upper floor of the house (now the bridal room), as the former conservation officer recalls. At the time of the purchase by the new owners in 2004, the property was in a deep sleep. Apart from the 1998 new tiled roof, it was a kind of weather and damp soil and ammonia in the mountain-side stall part battered housing, moreover, two feet sagged in the northwestern part and with a ridge that ran entirely from the angle. Thanks to the personal connection of the new owner to this house and her childhood memories the project was undertaken - with the goal in mind to renovate the building most authentic and historic humanely. Its present name, however, has an entirely different reason. During the restoration work 2004/2005 there were found original drawings from the French period, which were faded and torn badly, on a wooden tram. On the colored papers French soldiers and Katschtaler farmers and carpenters were drawn. More detailed research brought to light that the French invasion of Carinthia happened just before the small annex was build - early 1797 - and Napoleon himself marched to Klagenfurt on 30 March 1797. The second occupation by French troops occurred early in 1801, which lasted for several years. It is presumed that the troops came to the rearmost Katschtal and were quartered here also. 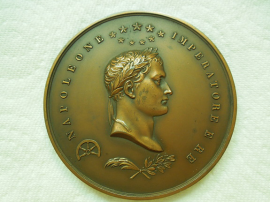 NAPOLEON’s armies conquered Carinthia several times from northern Italy and provided the militia and troops of the Austrian Emperor Francis I sometimes bloody battles. 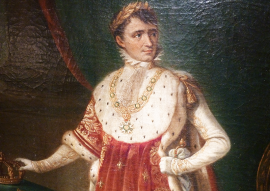 During the French Wars of 1797-1813 Carinthia was sacked hard by high contributions and mass deportation, and many reports are evidence that hunger, disease and death were everywhere. When Napoleon in 1809 blocked of the Habsburg empire from the sea, he united the areas of Tyrol, Upper Carinthia west south of Pörtschach, Carniola, Gorizia-Gradisca, Trieste and Croatia, the Sava with Istria, Dalmatia and Ragusa to the "Illyrian Provinces". From 1811 Upper Carinthia was under the political constitution of the kingdom "Illyria" and the maires had to swear on Emperor Napoleon. The administration was modernized and was partly done in French language. Many French terms like Gendarmerie (rural police), plafond (ceiling) or caleche (horse-drawn carriage, sleigh) are germanized evidence of the past. The ancient drawings gave rise to much speculation. Did the French army came to Rennweg, did Napoleon himself command raids here? They had to be fed, there were clashes. What impact did the years of occupation to the simple life of peasants, miners and craftsmen in the area. Who did the drawings, and what he wanted to tell with it? How and where were the young men hiding from the military service? Who is the mysterious beauty of the oil paintings from? Much will be hoping to shed, much forgotten forever. But the memory of these heady times remains awake. 1776, a smallpox epidemic broke out. Against this disease, there was no vaccination. 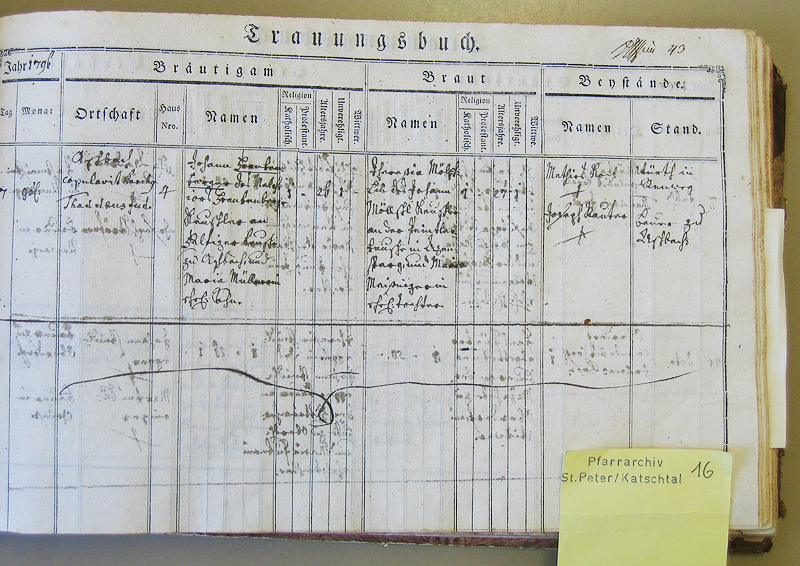 Little Peter Lechner from St. Peter am Katschberg lost his sight completely due to the consequences of this disease. But he consequently developed his sense of touch particularly strong. Even as a six year old boy, he was able to disassemble a pocket watch completely and reassemble it. 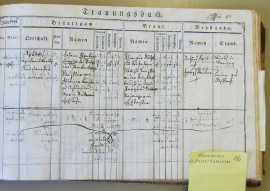 The blind boy learned the craft of watchmaking at the schoolmaster, church servant and organist Peter Sedlmayer from St. Georgen, who exercised also the profession of watchmaker. At the age of 20 Lechner created the clock tower of St. Michael am Katschberg. Therefore so he was also called to Villach in 1797 to repair the local church clock. A day after arriving French soldiers marched in Villach. In a dispute and a subsequent physical assaults dispute between the businessman Tomanelli and the French General Rusca that resulted from French demands for money, an astrolabe, which Rusca wore like a watch, was smashed. The astrolabe was part of a clock, that should show to the superstitious General Show the good and bad hours. Thereupon the General became so furious that he condemned the businessman to death for assault. The citizens of Villach now directed a petition for mercy to the General, which the latter agreed on condition that his astrolabe would be repaired again until the next morning. No one dared to take over this difficult work and it seemed the fate of the merchant was sealed. In this moment the people remembered the blind Peter Lechner, who did not need any light to work. The adjutants of the General brought Peter Lechner to the French headquarters where he worked throughout the night to return the repaired astrolabe to the General by 5 o’clock in the morning again. And thus Tomanelli’s life was rescued. 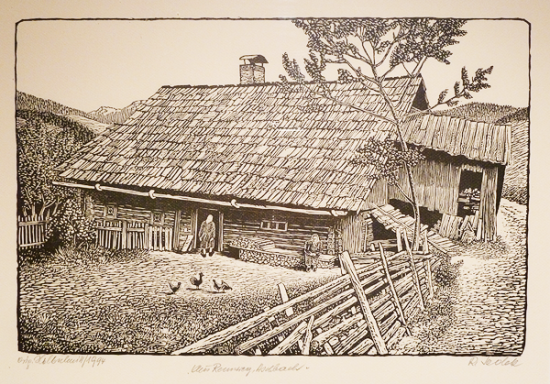 The blind Lechner returned home to the Katschtal richly rewarded. Here he studied alongside the watches also the establishment of mills, and died in 1827 at the age of 51 years. That also included alcoholic beverages such as beer, wine and liquor. The French pressed the local youth for military service and to escape this, many boys dressed as girls or hid. The Mühlbacher house in Mühlbach was adapted into a French customs house and all the goods that came from the north, had to be cleared here. The border to the Katschberg naturally induced to smuggle. Salt was the most popular contraband, and the still existing “Salztragersteig” leading from the Saraberg meadows to Zanaischg was a popular smuggling path. According to old stories some local boys and girls danced and celebrated with the French customs officers at the Mühlbacher, who was also an popular inn, while the farmers smuggled salt, tobacco and cattle on the Saraberg and Adenberg mountains. On 8 April 1797, the French have arrived here in the afternoon at 2 o`clock. In 1797, from 6 April to 30 April we have suffered demonstrable losses of 246 Gulden and 7 Kreuzer by the French. Loss in 1801 from 3 January to 23 March, proven and low estimated 794 Gulden 32 Kreuzer. In 1805 there was not written down what the French have caused damage. On 19 August 1813 the Austrian troops arrived here early in the morning and have caused me a loss for the year of 370 Gulden. they have caught me, to the ruddy life. and a knapsack on my back, such a pigs’ luggage. since there is a big pocket inside, but never a Kreuzer money.